Our 110 year old family business has quite the little history. Four Generations of Rasmussens have proudly designed and produced our products in Whittier, California, from where we still produce and ship everything today. 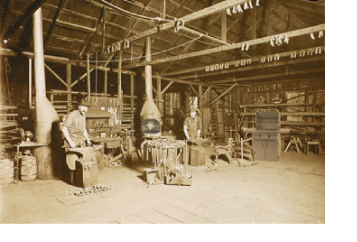 The year was 1907 when Rasmus Rasmussen opened his blacksmith shop on Philadelphia Street in Whittier, California. In addition to traditional blacksmith services like making horseshoes, Rasmus quickly developed a side business making fireplace tools and screens. This would be the groundwork for our gas logs we make today. Through the decades the business changed, Rasmussen Iron Works made truck body parts, steel building parts, even welding rod handles used to build ships for WWII. After the war, Rasmus’ son, Ted Sr., opened a fireplace retail store in front of the blacksmith shop. Among the items he carried were gas logs, which he and his son would learn more about. It would be Ted Sr.’s son T.R. that would make a breakthrough in gas logs in the year 1958. After seeing a plumber attempt to bubble natural gas through water to perform a “dancing flame” effect for the lobby of a restaurant, T.R. developed the sand pan burner, which is still in use today and continues to provide a flame that's as close to a real wood flame as can be in a gas log set. Although he came up with this burner innovation, he was still missing the logs. When he failed to find some other business to make logs for him, T.R. created his own molding technique, using actual wood logs as patterns and capable of reproducing the smallest details. Over the decades, T.R. would make many styles of logs, including oak, split, char, birch, manzanita, driftwood stumps, eucalyptus, and pine cones, as well as geometric shapes. This would not be the end of innovation though, more was yet to come. Now there is a fourth generation of Rasmussen continuing the legacy out of the facilities on Philadelphia Street. T.R. and his son, Rett, have continued to bring innovations. Rett would use his engineering background to help make the Chillbuster line of vent free gas log heaters, ALTERNA Contemporary Gas Fires (FireBalls, FireShapes and FireStones) and the Solaire Infrared Gas Grills. Rasmussen also started distributing the sleek and stylish Bromic Radiant Patio Heater line as a complement to Rasmussen's outdoor gas products. Despite all the changes over the years, the constants of craftsmanship, value, and industry leadership remain here at Rasmussen Iron Works, Inc. The Spirit of the Blacksmith works onward at Rasmussen!